The thing about Savannah Stopover’s lineup every year is that it always look better in hindsight. Stopover is one of the premiere festivals in the Southeast when it comes to new music discovery, or finding out what bands will be popular later in the year. This year’s lineup is no different. 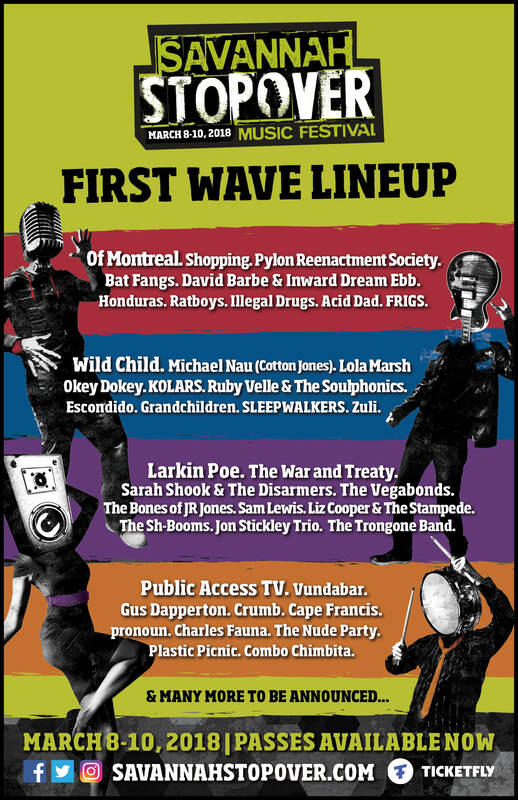 The first wave of bands features 40 bands over 4 days with Athens band of Montreal serving as the big ticket act so far along with larger font acts Wild Child, Larkin Poe, and Public Access TV. It’s down the bill where you’ll find some of the acts we’re most excited to see like Ratboys, Honduras, Zuli, and Acid Dad. Savannah Stopover serves as sort of a warm up for bands most of whom are touring out to SXSW. For Stopover downtown Savannah buzzes with music, with venues all over town hosting shows during the day and at night as festival goers bounce from one to the other usually catching partial sets of multiple bands. 2018 expects around 80 bands total with the second wave coming in January.